Guzman opened up with Scapegoat, Ash Blossom & Joyous Spring, Droll & Lock Bird, and 2 copies of Sky Striker Mecha – Hornet Drones. He activated Hornet Drones to Special Summon a Sky Striker Ace Token and then used the Token to Link Summon Sky Striker Ace – Kagari. He used Kagari’s effect to add Hornet Drones to his hand and then activated the Hornet Drones to Special Summon another Token. He used Kagari as a Link Material from Sky Striker Ace – Shizuku and then Set Scapegoat. In his End Phase, he activated Shizuku’s effect to try to grab a Sky Striker card from his Deck, but lost out to Ash Blossom & Joyous Spring. Tinoco activated Terraforming to add Trickstar Light Stage from his Deck to his hand, prompting Guzman to activate the effect of the Droll & Lock Bird in his hand. He activated the Light Stage anyway, using its effect to target Guzman’s face-down Scapegoat. Next, he Normal Summoned Trickstar Lycoris and attacked the Sky Striker Ace Token to destroy it. He Set a card to his back row before passing his turn. In the End Phase, Guzman activated his face-down Scapegoat, Special Summoning 4 Sheep Tokens to his field. Guzman drew another Scapegoat and then used Shizuku as a Link Material to Summon Kagari. He used Kagari’s effect to add a Hornet Drones from his Graveyard to his hand and then combined Kagari with a Sheep Token to Special Summon Knightmare Phoenix. He used the Phoenix’s effect to discard Hornet Drones and try to destroy Tinoco’s face-down Scapegoat, which Tinoco Chained to Special Summon 4 Sheep Tokens. 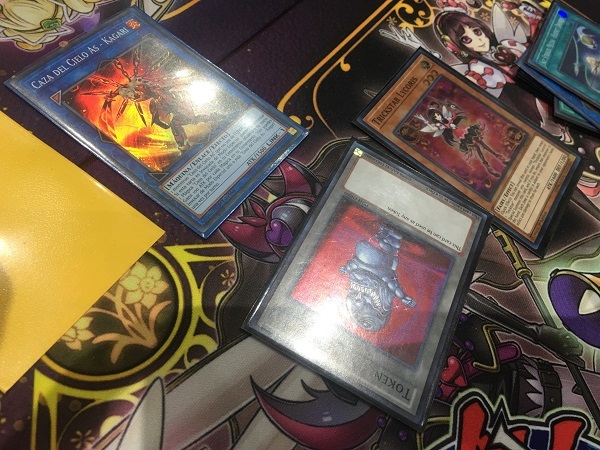 Guzman used his Phoenix and a Sheep Token to Link Summon Knightmare Unicorn next, and then used its effect to discard Hornet Drones and shuffle Lycoris back into Tinoco’s Deck. He Link Summoned Missus Radiant by using 2 Sheep Tokens as Materials and then attacked 2 Tokens to destroy them. He Set Scapegoat before passing his turn. Tinoco used his Light Stage to pin down Guzman’s face-down Scapegoat once again. He used one Sheep Token to Link Summon Link Spider and then used Link Spider and the other Token to Link Summon Knightmare Cerberus. He used his Cerberus’s effect to discard Sky Striker Mobilize – Engage! and destroy Missus Radiant. Guzman used his Radiant’s effect to return the Radiant to his Extra Deck. Tinoco activated Sky Striker Mobilize – Engage! next but lost out to Guzman’s Ash Blossom & Joyous Spring! Tinoco then Normal Summoned his own Ash Blossom & Joyous Spring and combined it with his Cerberus to Link Summon Triple Burst Dragon! He attacked the Unicorn with his Dragon to destroy it and then ended his turn. In the End Phase, Guzman flipped his face-down Scapegoat to Special Summon 4 Sheep Tokens to his field. Guzman drew Sky Striker Mobilize – Engage!! He used 2 of his Sheep Tokens to Link Summon Missus Radiant and then used another Token to Link Summon Link Spider. He then used his last Token to Link Summon another Link Spider and used all 3 of his monsters to Link Summon Borreload Dragon! He activated Sky Striker Mobilize – Engage! next, adding Hornet Drones from his Deck to his hand and drawing another Engage from his Deck with its effect! Then he activated that Engage, grabbing Sky Striker Maneuver – Jamming Waves! from his Deck and drawing the third Engage! He activated the last Engage! Tinoco couldn’t believe it! 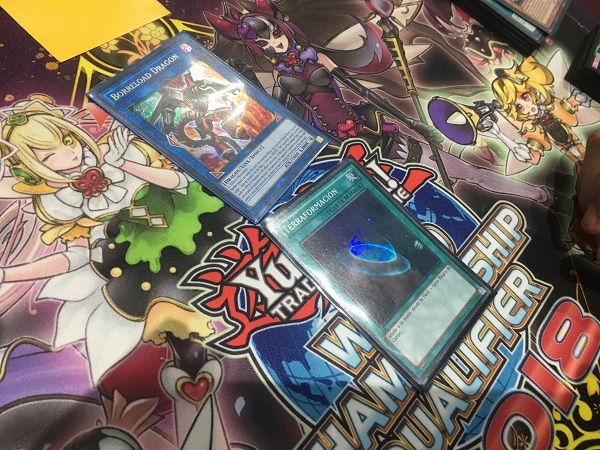 Starting his turn with no cards in his hand, he had activated 3 copies of Sky Striker Mobilize – Engage!! He used Engage to add Sky Striker Maneuver – Afterburners! to his hand and drew Trickstar Reincarnation. He activated Hornet Drones to Special Summon a Sky Striker Ace Token to the field and then attacked Triple Burst Dragon with Borreload Dragon, trying to take control of it with Borreload’s effect; but Triple Burst Dragon’s effect activated, negating Borreload’s effect! Borreload proceeded to destroy Triple Burst Dragon in battle. Guzman Set Trickstar Reincarnation and then ended his turn. Tinoco used the effect of his Light Stage to target Guzman’s face-down Reincarnation, which Guzman Chained to banish a Shared Ride from Tinoco’s hand, allowing him to draw a Sky Striker Mecha – Widow Anchor! He activated it to take control of Borreload Dragon and then attacked the Token to destroy it. In the End Phase, he returned Borreload Dragon to Guzman. Guzman attacked with Borreload Dragon, dropping Tinoco down to 3900 Life Points. Tinoco drew a card and then activated Terraforming to add Trickstar Light Stage from his Deck to his hand. He activated it and tried to search his Deck for a Trickstar monster but lost out when Guzman sent Ash Blossom & Joyous Spring from his hand to his Graveyard. Guzman drew his own Terraforming next turn, and when he activated it, Tinoco conceded, realizing he was defeated. 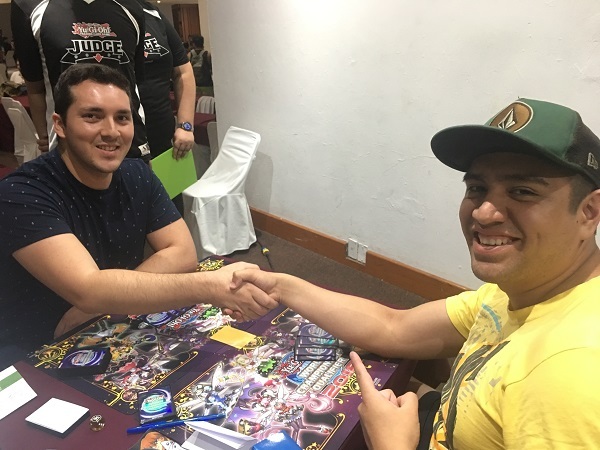 Roger Guzman Garcia takes the first Duel thanks to multiple activations of Scapegoat and a huge turn involving 3 copies of Sky Striker Mobilize – Engage!! 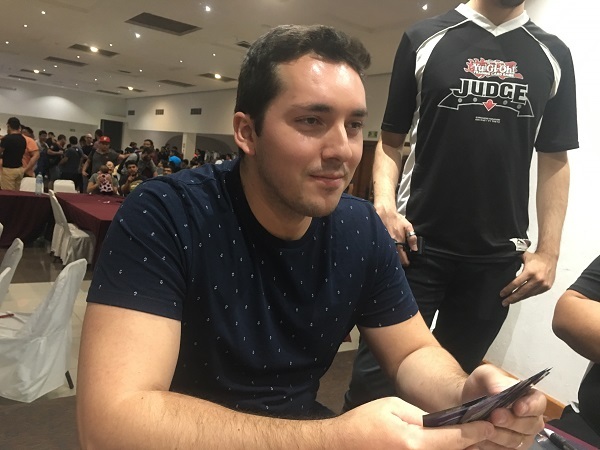 Tinoco activated Light Stage to add Candina to his hand and then used Pot of Desires to banish the top 10 cards of his Deck face-down and draw 2 more cards. He Normal Summoned Candina next and used its effect to add another Candina from his Deck to his hand. He activated the effect of the Lycoris in his hand to Special Summon it by returning Candina to his hand and then Set a card to his back row before ending his turn. Guzman opened up with Sky Striker Mecha – Hornet Drones, Sky Striker Maneuver – Jamming Waves!, Lycoris, Called by the Grave, Terraforming, and Scapegoat. He Set Scapegoat and then activated Jamming Waves, destroying Tinoco’s face-down Called by the Grave. He activated Terraforming next, and when Tinoco Chained Ash Blossom & Joyous Spring, Guzman Chained Called by the Grave to banish Ash Blossom and resolve his Terraforming. He added Light Stage to his hand, and then Tinoco activated the effect of the Droll & Lock Bird in his hand! Guzman activated Hornet Drones next, Special Summoning a Sky Striker Ace Token to his field. He used the Token to Link Summon Sky Striker Ace – Kagari and then used Kagari’s effect to add Hornet Drones to his hand. He dropped down to 6800 Life Points due to the effects of Lycoris and Light Stage throughout the turn. Guzman Normal Summoned Lycoris next, and then attacked Tinoco’s Lycoris with his Kagari, destroying it in battle. He attacked directly with Lycoris next, dropping Tinoco down to 6200 Life Points. In Main Phase 2, Guzman Set Light Stage in his Field Spell Zone. Tinoco activated the effect of his Light Stage to target Guzman’s face-down Scapegoat. He then Normal Summoned Candina and used its effect to add Trickstar Lilybell from his Deck to his hand. He used Lilybell’s effect to Special Summon it to the field in Attack Position and then attacked directly with Lilybell. Guzman lost 1000 Life Points, and Tinoco added Lycoris from his Graveyard to his hand with Lilybell’s effect. Next, Tinoco returned Lilybell to his hand to Special Summon Lycoris, and attacked Kagari with Candina, destroying them both. Tinoco’s Lycroris attacked Guzman’s next, destroying both of them too. Tinoco activated Twin Twisters next, blowing away Guzman’s face-down Light Stage and Scapegoat. Guzman activated Hornet Drones to Special Summon a Token and then used the Token to Link Summon Sky Striker Ace – Kagari. He used Kagari’s effect to add a Hornet Drones to his hand and then activated Light Stage! He used its effect to add Candina from his Deck to his hand and then activated Hornet Drones to Special Summon a Token to his field. He Normal Summoned Candina and used its effect to add Trickstar Lycoris from his Deck to his hand. He attacked directly with Kagari and Candina, and then Special Summoned Lycoris from his hand by returning Candina from his field to his hand. After Lycoris attacked directly, Tinoco was wiped out of the Duel! 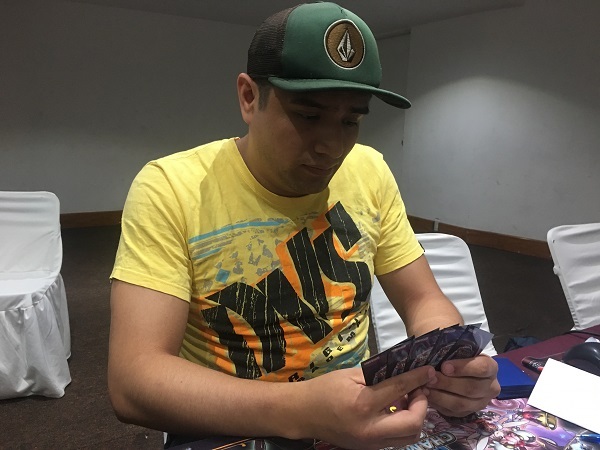 Roger Guzman Garcia is the winner of the 2018 Central America WCQ!